For the smalest 3 sizes you'll need one skein of each color, for the other sizes you'll need 4 skeins, 2 of each color, or 3 skeins if you do the cardi without stripes! Pattern is included as an instant download with your order! 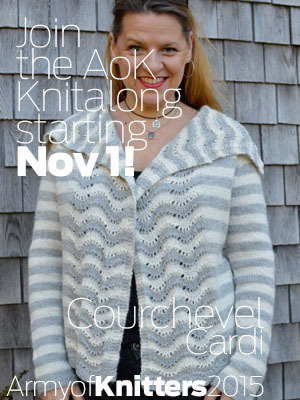 JOIN US FOR THE AoK FALL KAL! Click here for details! Heather Says: The attribute I admire most about alpaca yarn is its wonderful drape. To take advantage of this, I designed a cardigan that falls gently from the shoulders and can be worn open, or closed with a shawl pin. Featuring a long collar which falls to the back, or can be wrapped at the neck for extra warmth. A simple lace stitch at the extended fronts adds visual interest by altering the stripes. Select Colors (Select 2 Colors for striped, 1 for Solid) Scroll down to see colors!